Figure 4 (See color insert.) Types of multiple sclerosis plaques (KiMlP, macrophage marker). 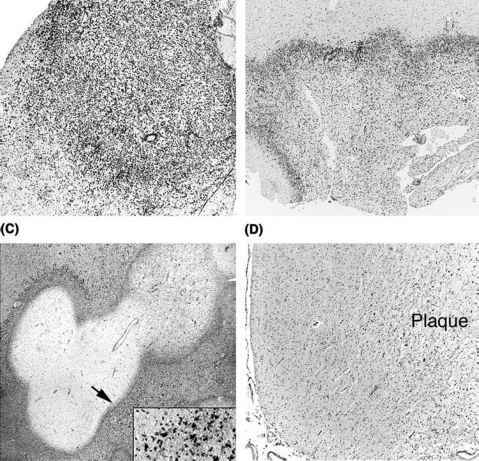 (A) Acute active multiple sclerosis plaques are characterized by extensive macrophage infiltration throughout the extent of the lesion with macrophages containing both early and late myelin degradation products. (B) The radially expanding active rims consist of macrophages containing early and late myelin degradation products clustered at the advancing edge of the plaque, and diminishing in number towards the inactive plaque center. (C) Smoldering plaques are characterized by a low grade of demyelinating activity at the plaque edge, with very few macrophages containing myelin degradation products. (D) The inactive plaque is hypocellular and contains no early or late myelin degradation products within the macrophages. very few macrophages restricted to the plaque edge containing early and late myelin degradation products (14). The ''inactive plaque'' contains no early or late myelin degradation products within the macrophages. Active plaques and active rims are mainly found in patients with acute or early MS, or in secondary progressive MS (SPMS) patients with ongoing clinical attacks. These plaques are usually associated with profound inflammation. Smoldering rims are mainly found in late phases of the disease, in particular, in patients with primary progressive MS (PPMS) or SPMS not associated with ongoing relapses (14). 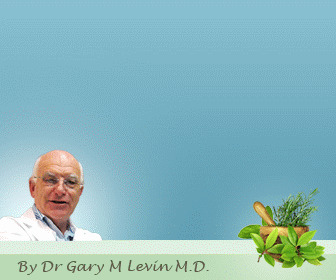 These plaques are typically associated with relatively less inflammation. The existence of a pre-active lesion derives from correlation of MRI and tissue pathologic features, and is largely based on a single MS patient who died in the active stage of the disease (15). Although numerous areas of MRI abnormality were present, only some revealed inflammation, blood-brain barrier damage, edema, and/or myelin pallor. This was interpreted as evidence of plaque development that preceded the overt dissolution of myelin sheaths. Although a pre-active lesion stage likely exists, it is doubtful that all brain lesions characterized by T2-weighted MRI abnormalities in which histological analysis reveals myelin pallor and some inflammation and edema are pre-active plaques. Both remyelinated shadow plaques and areas of Wallerian degeneration may show the identical pathological features that have been associated with the pre-active lesion, namely myelin pallor, edema, and inflammation. It seems likely that the earliest stages of demyelination depend on the identification of active myelin destruction and/or oligodendrocyte damage with myelin debris in macrophages.